Pre-Party at Obrien’s in Brandon this year, we are teaming up this year with the Sirens and holding a Joint St Paddy’s day Warm up weekend party from 5pm-9pm On March 2nd. 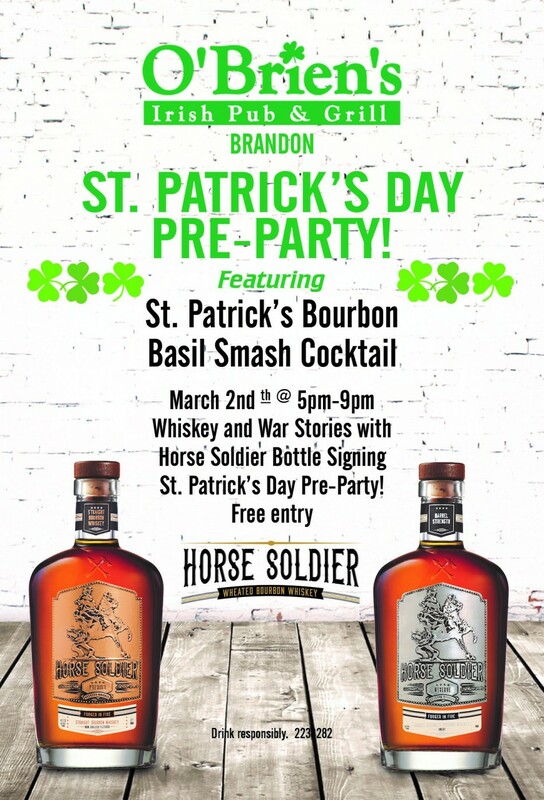 Our sponsor this Year Is Horse Soldier Whiskey/BREAKTHRU BEVERAGE FLORIDA. The guys from American Freedom distillery will be in attendance doing a bottle signing of all their products. JJ Taylor will be featuring beer specials as well. The Rough Riders will present a silent auction with featured items such as, fifty bottles of wine Basket, and gift baskets from the Sirens. 50/50 raffle, Bids in a 80 Year old bottle of Johnnie Walker Black, shot gun raffle, $1000.00 Gold and Diamond Sponsor gift, Cigars Restaurants certificates, Bar Tab Weekend stay in a condo on St Pete Beach, food specials and lots of other vendors and fun. Also, for the second year, we will be holding the Krewe drink Competition Info TBA. Last year’s winner was Pandora. Create your favorite drink with our Sponsors product and win the rights to Display the Traveling Parade Drink Trophy The party takes place on the outdoor patio and parking lot. The TR will be there as well as the Sirens Float and a DJ will also be playing your favorites.